I didn’t really blog at all this spring, but it’s mostly because I was too busy kayaking. Now that I’m in Colorado on a kayaking road trip I’ve got a bit more time on my hands so I’m going through photos trying to put together a couple of posts about this spring. Quinn Connell going big on the White in Vermont. 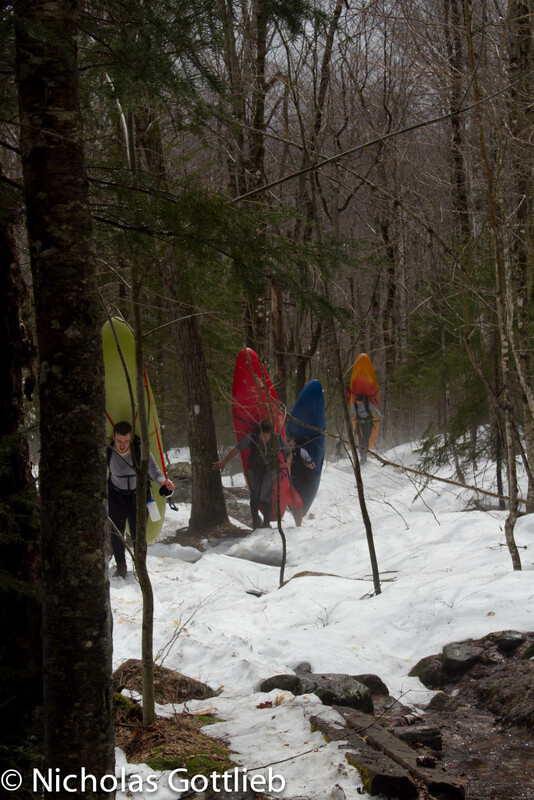 Spring melt waited until I got back from the Grand in Vermont and New Hampshire which worked out great for me. It was definitely a spring to remember. The huge snowpack left us with two full months of great creeking, followed by a couple weeks of rain that kept it going until the beginning of June. I ran the Big Branch over 30 times, with an average level probably over 3′ on the gauge. I think 4.5′ is my new favorite level — you walk Cave, but everything else is just phenomenal. 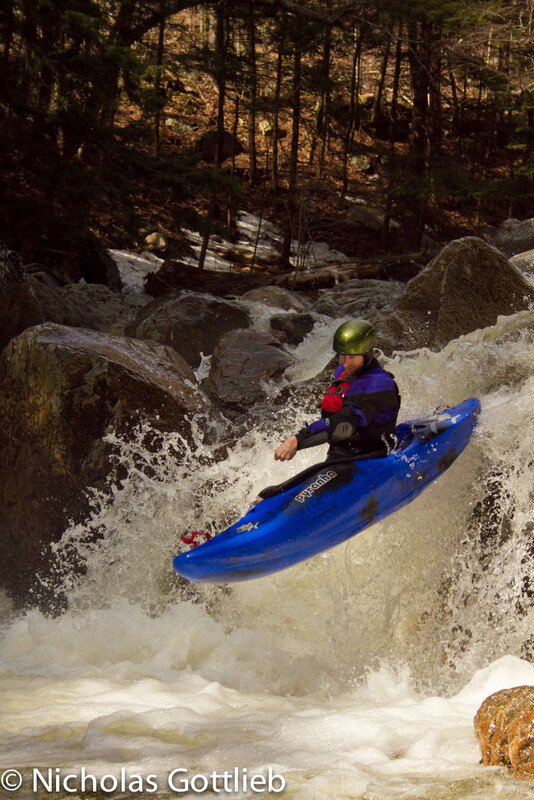 Danny Doran boofing Mushroom at low water early in the season. I finally got back on the Middlebury and the Sawyer this year and they’re both as great as I remembered if not better. 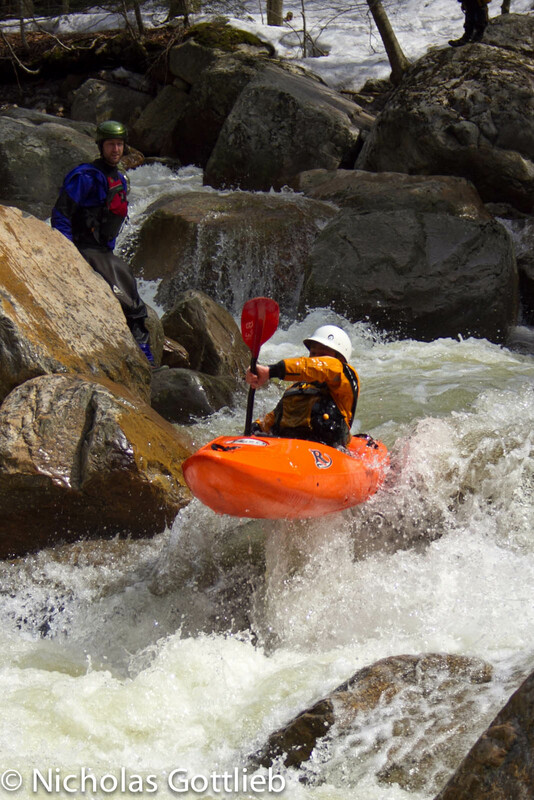 We also ran the right side of House Rapid on the Sawyer which is super fun, as long as you ignore the fact that you’re sliding 30′ down towards an undercut sieve. It’s fine, I swear. Alden Bird boofing left a second time. I went on two long hike-in trips this spring, one of which was the North Fork of the East Branch of the Pemi. We hiked in via the Ethan Pond trail from Crawford Notch and unfortunately got screwed by snow both on the trail and over the river, so we had to hike all the way down to Thoreau Falls in order to put on. We ended up taking two days to do it. Postholing with a loaded creekboat on your back is my idea of fun. 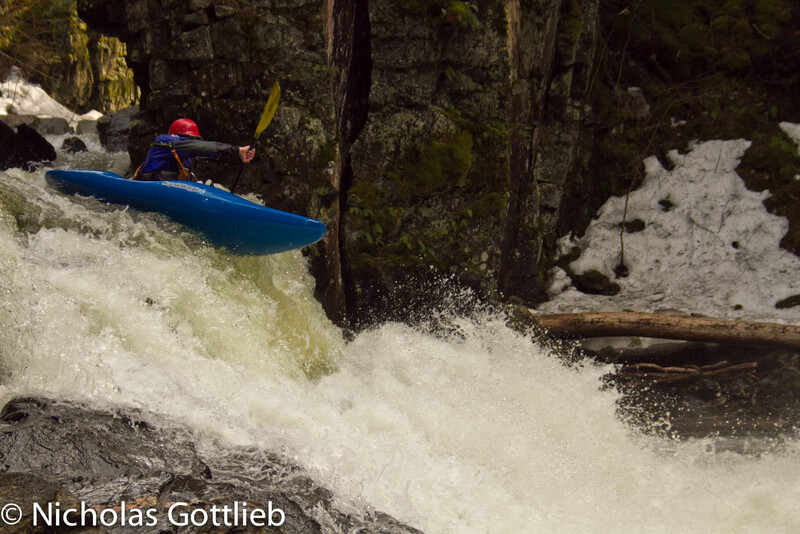 I also attempted to run the Opalescent River in the High Peaks of the Adirondacks this spring. It had been run once before, as far as we know, by Dennis Squires. We hiked in five miles up the Calamity Creek trail and camped at the Flowed Lands lean-to. Unfortunately, by morning, the river had risen 8″. So we put on and paddled to the start of the gradient — Hanging Spears Gorge — and took out and hiked around everything, about two miles, putting on to run the class II/III runout and flatwater paddle out. We didn’t get to run any of it, but good god this thing looks amazing. The upper gorge is pretty marginal and culminates in the very-runnable 55′ Hanging Spear Falls, but the lower gorge is just back-to-back 10-20′ bedrock drops. Can’t wait to get back there with better levels. Quinn wishing we were kayaking not hiking. 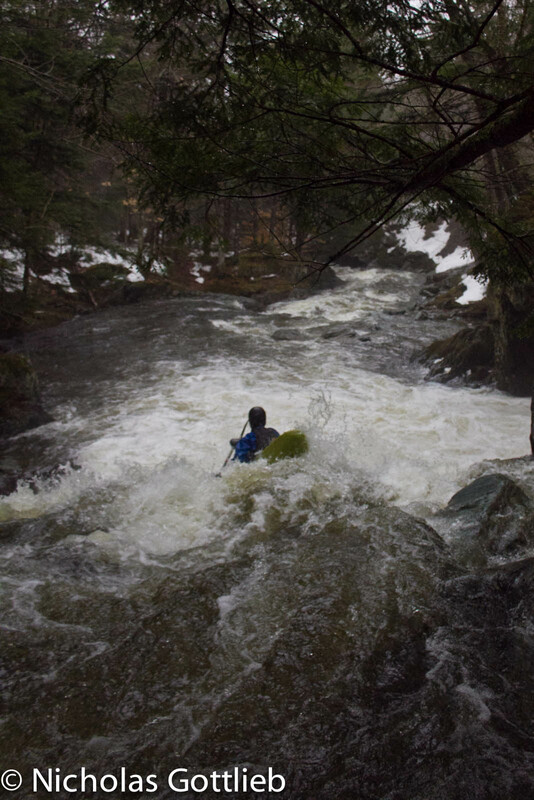 A couple other highlights from this spring include running the Terrill Gorge of Kennfield Brook, a surprisingly quality little-known run in northern Vermont. Thanks to Dave Packie for the heads up about this one. 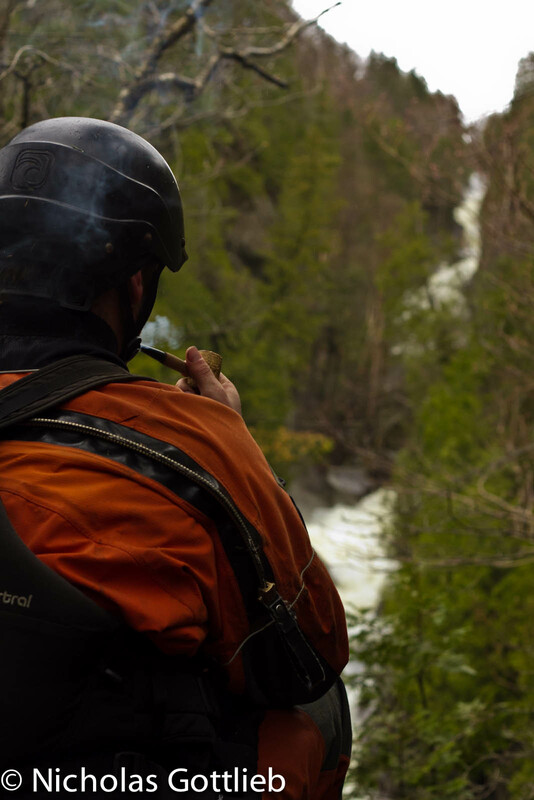 Christian Woodard boofing the last drop on the Terrill Gorge. 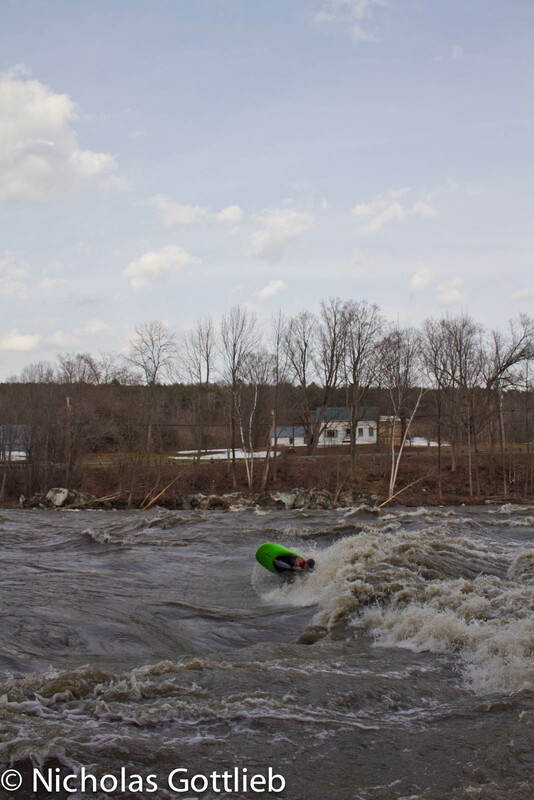 I even had a few high-water laps on the elusive but awesome North Branch of the Winooski. Billy Wagner on the second drop of the NBW in disappointingly bad lighting. I did a lot of park-and-huck exploring this spring as well and found some awesome drops, but that’ll be the next post. Wonderful pix, Nick. Keep ’em coming!